Well, it's all going on in Upstairs Downstairs, and it's only episode two. Much of it is food related, however, and we all know the dramatic potential of a perishable: limited. So we have stroppy but dependable Cook Thackeray and her violet macaroons, or mixed-messages maid Beryl and her oysters, as well as general food preparation drama about missing desserts and eggs used without permission. Like tv-ooh says: it's all going on. And then upstairs there's a posh dinner for the American ambassador, where Lady Agnes tries to overcome her disappointment at not being able to have any more children by slightly flirting a bit with Casper, an American member of the Ambassador's party, as you do. He wants to do the Rumba with her (he mentions it in every scene he's in); while, later, Cook helps a young Jack Kennedy with an upset stomach (from the dinner he was served?). But much more troubling, he's afflicted with an American accent that comes and goes, and Cook doesn't have a cure for that in any of her cupboards. 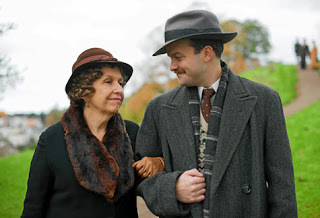 Anne Reid's Cook Clarice Thackeray gets lots to do in this episode and could easily become the heart of the show: her and her violet macaroons. We learn she brought a freshly baked batch of them to her brother's death bed - he'd gone beyond swallowing at that point, says her newly introduced nephew Tom, so he ate them himself - and then after a few more run-ins with the uppity butler Mr Pritchard and his exacting standards (the final straw for Clarice was him using the macaroons she'd made for her family at the American's dinner), she gets on the bus to Bermondsey to stay with Tom her nephew and his wife and young son. Meanwhile, Harry and his white vest and braces continue to flirt with new Essex maid Beryl - and to labour the point she offers him a freshly caught oyster. "You want to be careful, feeding me aphrodisiacs," he says. He may well have oil or grease smears on his uppers arms, so blatantly is he labelled LOVE INTEREST for the audience. But any budding romance is nipped in the bud. "You ought to be careful," Beryl replies, "making lewd remarks." So that's set that romantic sub-plot back an episode or two, perhaps until Alex Kingston's character's own romantic sub-plot gets into full swing. The love interest storyline will be welcome for her character, because at the moment Alex Kingston mainly has scenes where she talks about HOW GOOD SHE IS AT FILING. So her advanced admin skills are called in to use to help sort out orphaned children: "I hoped you might implement a system," Mr Amanjit tells her, with a furrowed brow. Fortunately for everyone, she also receives a secret letter from a lover, which, because it's telly, she throws into the fire - a sure indication of trouble ahead. Bring it on, as they didn't say in the late 1930s. Upstairs Downstairs: So that was series 2, but will there be a series 3?